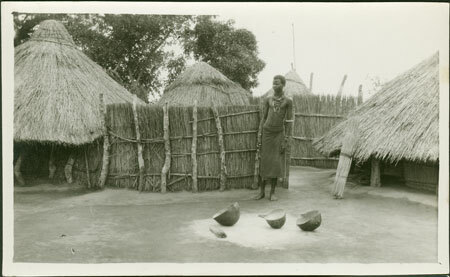 An Anuak man standing within a homestead courtyard, with gourd vessels and a brush in the foreground. The homestead consists of a number of thatched huts, interconnected by reed fences to create discrete domestic spaces. In the background are several notch-carved elongated fence posts, which often denotes the homestead of a village headman in Anuak communities. Morton, Chris. "Anuak homestead interior" Southern Sudan Project (in development). 03 Jan. 2006. Pitt Rivers Museum. <http://southernsudan.prm.ox.ac.uk/details/1998.204.5.61.2/>.